Online patient communities, also referred to as online health or support communities depending on their focus, have seen incredible growth over the past decade. There are online groups for people dealing with a range of issues such as addictions, bullying, cancer, chronic pain, depression, HIV, and infertility. There are also groups for lesser-known issues such as rare autoimmune disorders. Describing the positive role these groups play, Anne C. Jones, LCSW, PhD, a clinical professor at the University of North Carolina at Chapel Hill's School of Social Work, says, "Knowledge is power. The more information you have about any physical or mental health condition, the better off you are." She cites benefits such as acquiring information, gaining access to the resources provided by the group, and being able to connect with other people who are dealing with the same issues. "It helps patients and their families to feel that they're empowered, that they're better able to cope with whatever they're going through, and that they're equipped to make better decisions." These online communities offer a range of features designed to connect and support their members, and the actual sites are as varied as the issues they address. At a minimum, most sites provide a discussion board where users can connect to ask questions and share information, along with information and links to relevant resources. But there can be a wide range of features beyond that, such as photo galleries, chat rooms, and even offline events for members to attend. Membership is often in the thousands, and new members are joining these groups daily. What is it that makes these online communities so effective? "They provide expertise that isn't available in other places," says Jina Huh, PhD, an assistant professor with the department of biomedical informatics at the University of California, San Diego School of Medicine. She notes that in addition to clinical expertise, participants also get patient expertise on a wide range of health issues. Group members connect with people outside their own geographical region or social circle, acquiring information and input that they wouldn't otherwise have access to. Traditionally, the medical community has placed limited importance on patient expertise. Huh explains that this is changing, with a growing recognition of "the important role of patients with firsthand knowledge of a health issue, who know what it's like to go through the experience of living with the issue." For example, online health communities serve an important role for people with rare diseases and disorders, where information and solutions are often limited. "It's important to have these spaces where people can interact with others who are going through similar issues, and where they can share their experiences," Huh says. Such interaction is useful for providing information and support, and helps to create a feeling that the individual isn't suffering alone. Priya Nambisan, PhD, an assistant professor with the department of health informatics and administration at the University of Wisconsin–Milwaukee College of Health Sciences, explains that the information accessed from within an online community often carries extra weight precisely because of group members' direct experiences. "Information received from peers who are experiencing the same issues may be more trusted and accepted than the same information coming from a health professional," Nambisan says. This increased level of trust and acceptance has the potential to directly influence health outcomes among various populations. As an example, Nambisan cites people dealing with addictions who are at different stages of rehabilitation: "People may be more receptive to interventions when they're able to get information and support from peers who are going through the same experience." The social support provided in these groups is immensely valuable and goes hand in hand with the specialized, firsthand information that group members are able to offer their peers. Quality social relationships are recognized as a critical factor in the well-being of people dealing with serious health issues. According to Huh, "Beyond family and friends, if someone knows that there's a group of people who can provide personalized advice, it can have a significant impact on that person's life." Many of these groups use online platforms that allow photographic and video content to be posted from group facilitators and members. By enhancing the communication between members, these tools strengthen connections and improve relationship building among group members. "The richer the communication media, the richer the interaction can be," Huh says. This leads to an increased level of engagement and social support within the group. The use of videos, such as in video blogs, is particularly useful in facilitating this type of engagement and support. Huh explains that the ability to view someone's facial expressions and body language enhances the communication experience between everyone involved. "There's a social synchrony that happens, an unconscious way of trying to build rapport when communicating," she says. "Similarly, in the case of video blogs, the person talks to the camera as if they're talking to you. It's an enriched experience." This process often leads to additional conversations developing among the video's viewers. As expected, the social support offered in these online groups can convey a sense of empathy to the recipients of that support. However, a noteworthy study finds that information-seeking effectiveness plays a crucial role in patients' perceived empathy in online communities run by health care organizations (Nambisan, 2011). While this finding may at first appear counterintuitive, it makes sense, given that empathy revolves around understanding a person's condition and needs from their perspective. Nambisan explains that information support contributes to a perception of empathy when it effectively meets a need, as this demonstrates an understanding of the information seeker and his or her needs. This process differs from listening and offering sympathy (although this is also valuable and has its place). "Sympathy is not empathy," Nambisan says. "If someone can provide information relevant to my situation, it means they understand what I'm looking for, and that's meeting my needs." Such understanding, which is key to empathy, is a large part of what makes these online communities so effective. A growing number of health care organizations now provide access to online support communities as a way of meeting patients' needs and treating the whole person. "For the hospitals and organizations providing these online communities, they're a good supplement to the face-to-face physical care provided," Jones says. She notes that these online groups often address psychological, mental health, and spiritual needs. Nambisan points out that by enabling open discussion within these groups, health care organizations can enhance their credibility and build trust with their clients regarding the programs being offered. "When people have the freedom to discuss the program openly," she says, "it shows that the service provider has confidence in the program." These groups also serve as an important supplement to traditional health care services with their capacity to raise awareness and educate the larger population. This has been the case for a number of health issues and demographic groups. "A lot of women's health issues received increased attention because women were able to come together in these communities and draw attention to their cause," Nambisan says. Jones believes social workers' skills are relevant in online communities, and they shouldn't be deterred by online platforms. 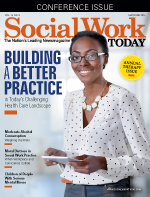 "Social workers might ask, 'Technology and group work—how do they fit together?' But skills are transferrable from in-person groups to online groups, and technology can be harnessed to enhance group work and facilitation processes." She explains that just as group norms and guidelines need to be established in an in-person group, this is needed in online groups as well. A benefit of the online environment is that it provides additional capabilities for documenting those norms and guidelines. "There should be specific guidelines for communication and interactions, just as we would provide in face-to-face groups, so that participants know what's okay and not okay as they navigate these groups." Regardless of the community's focus, it's essential that the community provides a safe and secure environment for everyone. Participants need to feel that they can engage with others safely and securely while sharing personal information. One of the ways this can be achieved is by monitoring who joins and participates in the group. "If there's an application process to participate in the group," Jones says, "it can help to make the group safer in terms of confidentiality." She adds that a group might monitor the communications of new members initially, to ensure there are no problems arising from a new member's involvement. This type of unofficial trial period can be especially valuable for those groups likely to have particularly vulnerable participants due to the issues being addressed. Jones also identifies site access and moderation as important safety factors. "Is it password protected?" she asks. "Are there people moderating and monitoring the chats and e-mails to make sure the communication is supportive, educational, and therapeutic in nature?" Lastly, Jones cautions that with so many online groups available, it might not always be clear who is in charge and running the group, especially when a group isn't affiliated with an established organization or hospital. She advises that social workers can assist their clients to clarify who is leading the group and their relationship to the issue: "If they [clients] are going to become involved in an online community, they should find out who's actually facilitating it and running it." Nambisan, P. (2011). Information seeking and social support in online health communities: Impact on patients' perceived empathy. Journal of the American Medical Informatics Association (JAMIA), 18(3), 298-304.